A truly original coming-of-age story, but who is the king of Tuzla? ‘I wrote those stories down in the evenings,’ said Tijmen. Without a word David took two new glasses from the waitress. ‘And during the day?’ asked David. ‘To the king!’ toasted David. Two men sat down at the table next to theirs. Touché was the only pub that David and he sometimes went to: their old local in the centre of Arnhem. David had changed: he’d become calmer, more thoughtful. As always in summer there was a red glow on his skin, which shone with ointment. He suffered from a skin complaint and on hot summer days it always lay in waiting, ready to erupt. This disease made David’s appearance even more rugged, as if the grooves in his face had been etched all the deeper. And yet there was still something boyish about him. Suddenly there were thoughts of another summer, long ago. He had bumped into David on the parade ground and his swollen skin was covered in ulcers. Only after much insistence had he agreed to tell the doctor. ‘Only because it’s you,’ he finally said. At last Tijmen could tell someone what had got into him. It had a strange attraction that surprised him. In flickering film images the base lay spread out before Tijmen. It was definitely going to be a beautiful day. It was raining, but the sun was making strenuous efforts to break through the clouds. He started the jeep and pulled onto the road, leaving the wood with the company’s quarters behind him. At the kitchen one of the cooks waved to him. His hand went automatically to his beret. For two days his company had been under the command of Nordbat, the Norwegian-Danish-Swedish battalion that was billeted around Tuzla, initially for a period of two weeks. Who could say whether it would stop at that? Links with the battalion in Srebrenica had been temporarily severed. Just as well: from now on he was more or less his own boss. He was king, king of Tuzla. Hadn’t the commander said that he, Tijmen, was in command at night? He was filled with a modest feeling of pride. For the time being the commander was sleeping at the Tuzla Hotel. He chuckled, the men had dubbed the Norwegian air force colonel ‘Tom Cruise’. The car shot across the dark-grey apron and then turned left onto the runway. He cast a quick glance into the distance at the hostile Viz mountain, where the Serbs had their positions. ‘Sugar Hill’, the Swedes called it. With rapid movements he steered the vehicle deftly from left to right across the gleaming asphalt. The tyres screeched: little chance of them hitting him. Along the whole south-eastern side of the base there was no sign of a fence. In the distance were dark hills, clad in the green of dense pinewoods. This evening he would send an armoured personnel carrier, YPR, to this side of the camp to deter intruders. He had seen on the news how they had called the YPR a ‘tank’. He scoffed at the paradoxical nature of his mission: securing the airbase in order to ensure the supply of aid meant principally ‘keeping the population out’. He passed the munitions storage and the hangars, which once housed the planes of the Yugoslav air force. Between two of the hangars was a wrecked aircraft, stranded on its belly. A red star still adorned the broken tail. Once this was the largest airbase in Yugoslavia. Someone had told him that there had been five runways. Drent handed him his plastic UN mug. Remnants of soup were stuck round the rim. He turned the cup round and sipped his tea. From here there was a good view of the road to the village, of all the traffic to and from the east where the front was. Not far away a few boys were practising basketball shots. On the other side the base stretched out, largely obscured from view by the woods behind the hangars. Kolenbrander climbed the steps and joined them. Tijmen listened to the impact of mortar rounds to the north-east. How stultifyingly dull it must be for the men to note every strike, often miles away. There wasn’t much point to the task: in the evenings these notes were not listed in the situation reports. Only if the airbase itself came under fire, there was a slight chance that it would be noticed in the headquarters in Kiseljak. Drent pointed down. At the bottom of the tower the sandbags were torn. Tijmen made a note. Together with the repairs to the fence those tasks would be quite a job. What’s more, only part of his force had arrived. The rest were still in the hotel in Brela on the Croatian coast, and would follow on later. In the snow-covered wood above the road old Galib Prolaz, ‘the Yugoslav’, like a sleepwalker, was chopping the timber into small blocks that he would later take home. Propped against his wheelbarrow was his hunting rifle, an heirloom from his father, who under Tito had used it to fight the Germans. Galib had a wife, Raza, and two daughters: Svetlana, named after Stalin’s daughter, and Fata. Both were still unmarried, although they were well over thirty. This caused resentful gossip among the villagers, and behind his back they said he thought he was too good for them. Sometimes he heard the whispering behind him. But he had little to do with the village: his house was on the edge of it, in a plum orchard. Only on Fridays did he go down to the village to attend the mosque. When the first rumours of night-time massacres reached the village, he had stubbornly denied them; he was a Yugoslav and would always remain one. Every morning his wife still made his sandwiches and he went cheerfully to the town hall, where he worked in the registry. The bullying had started almost imperceptibly. At times his papers would go missing, at other times someone would have moved his desk. During lunch his table became increasingly empty. He was blamed for the disappearance of three blank passports, which, as everyone knew, fetched a fortune on the black market. After that Galib had the table to himself. But they didn’t dare fire him, though less and less work landed on his desk. Till one morning it proved impossible to travel to town. The Muslims had been driven out of their homes during the night. At least, that was what Alija, Hamzić’s son, had told him on the way. Galib had returned home with his briefcase and his sandwiches. He said to his wife that it really was war now. Not long after, in his own village, ‘the man from Marrakech’ had disappeared; he was blue like the men who lived in the southern Atlas Mountains. No one knew his name or where exactly he came from. ‘Marrakech’, he would say with a vague smile when asked. He’d appeared in the village one day and had never left. He lived on what people gave him and led an unobtrusive life, until his sudden disappearance. The man from Marrakech sparked a panic. The following night all the Croats had to leave the village head over heels. Since then Galib had worked on his vegetable plot, cut wood and fetched water from the stream. Fortunately, he still had a couple of goats that gave plenty of milk. He had always bred goats in his spare time. He even had won prizes with them, but he had never thought they would come in handy like this. What he always had tried to prevent had happened after all: he, the proud civil servant Galib Prolaz, the Yugoslav, had become a farmer among farmers. ‘Dangerous words,’ said the mullah later. After that Galib withdrew into his house and lived on what the poor land provided. At the beginning of winter he had sold his train collection. In that way he hoped to survive to the end of the war, although he could feel the strength slowly flowing out of his body. If he had not been taking care of his wife and daughters, he would have long since lost heart. He chopped doggedly on. There was snow in the air. Just one more day and then he wouldn’t need to come out for a while. From: King of Tuzla, you can order the book from the Order link in the top right hand corner on this page. It was July 1995. David had already said on the telephone that he couldn’t make it too late, but had come straight to the pub in Korenmarkt, one of the main squares in town, when Tijmen rang. David took the two glasses the waitress had brought from the bar. ‘Have you heard?’ asked David. Tijmen nodded. There was something conspiratorial about their meeting. Srebrenica had fallen. An unstoppable stream of rumours had begun to flow. The Minister of Overseas Development had already talked of thousands of dead. He had used the word genocide. For a second Tijmen felt a hint of painful affinity with the men who were now in Bosnia: soldiers of Dutchbat, airmobile, red-beret, blue-beret. But the affinity was no longer really there. The last CO of Dutchbat had failed hopelessly. There was only David left. The one person he still saw, a last link with his past. David shook his head and bent forward towards the notebook Tijmen had put on the table. Old Pista Rácz took hold of the basket of loaves and dragged it into the dark shop. His son Béla smiled in welcome. He took the flat loaves out of the basket and laid them one by one on the shelves. He couldn’t get them up there fast enough: the queue outside the shop was getting ever longer. Pista went out back again and fetched more new loaves. After the fourth basket he sat down for a moment and lit a cigarette. Indeed, the vast majority of the Jewish community had already left, but Pista had stayed. His family had come to Sarajevo at the end of the nineteenth century, with the Hungarian occupying forces, and had never left. His family in the Diaspora, spread through the whole of Europe and North America, wrote long letters in an attempt to persuade him to emigrate with his family. Uncle David in New York promised to send money for the journey, and cousin Saul in Lyon had offered to find him a job. All Pista had done was to write back polite but determined letters, and after Passover he had found a refuge for his wife Agi and daughter Agnes with friends in the countryside. They had not visited him since the summer. The old town was becoming more dangerous every day. But as long as Rabbi Steiner stayed, Pista would stay, and he knew that the Rabbi would never leave the town. The queue outside seemed endless. Soon he would have to disappoint people again. Business seemed to be thriving, but people could no longer pay. So Pista accepted everything: goat’s cheese, rakija, cigarettes and even clothes. His customers were now mainly Muslims. The greeting ‘salaam aleikum’ rang through the shop with increasing frequency. The other groups had left, and with them the range of bread on offer also shrank. The matzos, which with approval of the rabbi he baked for exactly eighteen minutes, and the bread that met the requirements of the Koran. But also black Russian bread, croissants, baguettes, English pies and Viennese bread. He had been famous for his Schwarzwälder Kirsch, but now virtually all he baked were flat Turkish loaves. He was supplied with flour by the battalion from the Ukraine and occasionally from UNHCR. Sugar, though, was becoming an increasing problem. At the end of the morning, when the last loaves had been sold, Béla pushed the people back. Pista had just put three padlocks on the door and was watching the unlucky ones slinking off with a dazed expression on their faces, when he heard the low growling sound. The glass in the windows trembled and father and son dived under the counter. The blast shattered the glass. ‘That was a close one, Dad,’ shouted Béla. The old man looked round his bakery for the last time. A few seconds later there was a gaping hole where once Pista Rácz’s shop had proudly stood, smouldering in the cold winter air. Real war is different. Real war quite literally smells different from peace. All of a sudden Tijmen finds himself in a proper war as part of the UN in Bosnia in the former Yugoslavia, the scene of the last war in Europe. This was something he was trained for and something he should relish. With his colleagues, Lex and Eddy, he experiences a different face of life. For Eddy war is a game and according to Lex every game is a war. For Tijmen it is a symptom of a society and organisation he no longer wants to belong to. We learn more about Tijmen, about his quest for love and choice of a military career, which is surprising to his family. This is linked to the war of his father. His hilarious adventures at the military academy make us smile. Soon though it becomes clear that Tijmen has a truly original way at looking at what goes on around him. Seeing things this sharply does not make for an easy life. Hence King of Tuzla does not describe military battles or discuss strategies but instead it shows how war affects ordinary people, soldiers and civilians. Interspersed with Tijmen’s story about finding his own identity within a strict military environment, we are shown vivid snippets of the life of ordinary people in the war zone. Civil servant Galib Prolaz, a self proclaimed Yugoslavian citizen, who after the Muslims were driven away, had no alternative but to become a farmer. The beautiful Lucia Mezga, who behind the bar of ‘Holland House’, dreams that officers are queuing up to marry her. Old Jewish baker, Pista Rácz, who stays put, following the rabbi who refuses to flee, and who by serving everyone, including his enemies, pays with his life. Tijmen, ever the professional soldier, makes his war a success, and he brings all his men back. Twice he has to build a base from scratch, in Tuzla and in “Sapna Thumb”. But there on the first base at least he is the King of Tuzla. More and more disappointed with his colleagues, society and even himself there are some interesting revelations, especially when he speaks to his friend David, the one he tells so much. Do Tijmen’s ambitions survive this war and does he come to terms with how he has changed? Read King of Tuzla to get the answers and become gripped by the story. 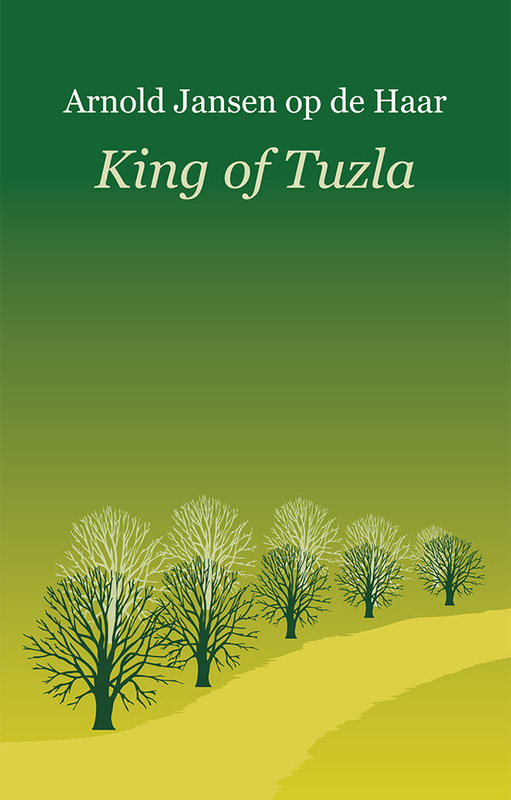 You can buy King of Tuzla now by clicking on the ‘Buy this book’ button on this page. Your card will be debited in your local currency. Other titles by Arnold Jansen op de Haar: Angel, The Refrain of Other People’s Lives & Yugoslav Requiem. Also promoted on Novel Suggestions.